We deliver a complete-line of pneumatic Encore Hartco clips, tape and poly-cord collated clinch clips and coils of clips for clip tools and automated clip machines. 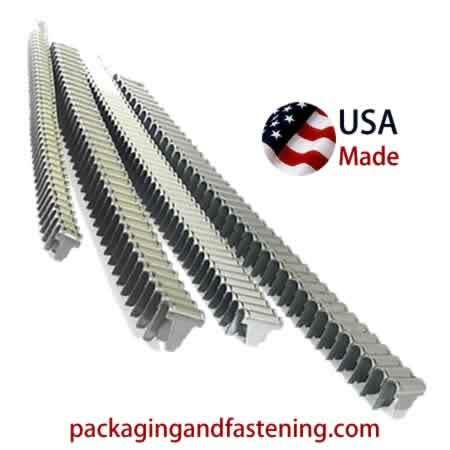 Buy your pneumatic collated clinch clips online for bedding applications, cages, packaging, automotive seating plus more three gauge to 16 gauge wire-to-wire fastening. Check out our collated aluminum clips, galvanized clips or stainless steel clips for your next clipping job. Learn more. Eclipser and Hartco pneumatic clinch clips are polycord collated to maintain a consistent strip of basic steel, aluminum, galvanized or stainless steel clip fasteners . Order now from our easy to use online fasteners catalog. 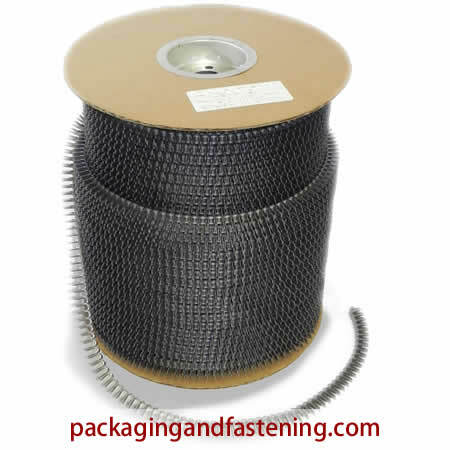 PACKAGINGANDFASTENING.COM delivers clinch clips to feed Encore Hartco strip magazine clinchers for efficiently fastening wires. We carry Classic Hartco series aluminum clinch clips for your next clip fastening job. Fits Hartco Tools HR-85SBL, HR85SBLT 2,160-Pack 7/8" x 43/64" x 7/32" Collated Aluminum Clinch Clip. Fits Hartco Tools HR-85SBLN, HR85SBLTN 2,376-Pack 3/4" x 43/64" x 7/32" Collated Aluminum Clinch Clip. Fits Hartco Tools HR-85SBL, HR-85SBLT 2,040-Pack 7/8" x 23/32" x 1/4" Collated Aluminum Clinch Clip. Fits Hartco Tools HR-85SBLN, HR-85SBLTN 2,244-Pack 3/4" x 23/32" x 1/4" Collated Aluminum Clinch Clip. Fits Hartco Tools HR-55B, HR-66B, HR-85BA, HR-85BF 2,880-Pack 7/8" x 35/64" x 7/32" Collated Aluminum Clinch Clip. We carry Classic Hartco series cushioned clinch clips for your next furniture clip fastening job. Fits Hartco Tools HR-66B 4,500-Pack 7/8" x 7/16" x 11/64" Paper Lined/Polycord Collated Cushion Clip. Fits Hartco Tools HR-65BAH, HR65BAT 3,960-Pack 3/7" x 1/2" x 11/64" Paper Lined/Polycord Collated Cushion Clip. Fits Hartco Tools HR-65BAH, HR65BAT 3,600-Pack 7/8" x 1/2" x 11/64" Paper Lined/Polycord Collated Cushion Clip. Fits Hartco Tools HR-65BAH, HR65BAT, HR65BSH 3,150-Pack 7/8" x 39/64" x 11/64" Paper Lined/Polycord Collated Cushion Clip. Fits Hartco Tools HR-85B, HR-85BA, HR-85BF 2,040-Pack 7/8" x 43/64" x 7/32" Paper Lined/Polycord Collated Cushion Clip. Fits Hartco Tools HR-85BS, HR-85BSF 2,040-Pack 7/8" x 23/32" x 1/4" Paper Lined/Polycord Collated Cushion Clip. Fits Hartco Tools HR-66B, HR85BA, HR-85BF 2,880-Pack 7/8" x 35/64" x 7/32" Paper Lined/Polycord Collated Cushion Clip. We carry Classic Hartco series galvanized clinch clips for your next clip fastening job. Applications include cages, fencing and other corrosive environments. Fits Hartco Tools HR-45, HR-45A 9,000-Pack 7/16" x 27/64" x 11/64" Galvanized Clinch Clip. Fits Hartco Tools HR-65BAH, HR-65BAT, HR-65BSH 3,465-Pack 3/4" x 39/64" x 11/64" Galvanized Clinch Clip. Fits Hartco Tools HR-65BAH, HR-65BAT, HR-65BSH 3,150-Pack 7/8" x 39/64" x 11/64" Galvanized Clinch Clip. Fits Hartco Tools HR-55B, HR-85B, HR-85BA, HR-85BF, HR-85SB 2,800-Pack 7/8" x 43/64" x 7/32" Galvanized Clinch Clip. Fits Hartco Tools HR-61 3,360-Pack 7/16" x 43/64" x 11/32" Galvanized Wide Razor Wire Clip. We carry Classic Hartco series regular brite steel clinch clips for economically fastening your next wire-to-wire clip job. Fits Hartco Tools HR-68B4,860-Pack 11/16" Wide Polycord Collated Regular Clinch Clip. Fits Hartco Tools HR-65BAH, HR-65BAT, HR-65BSH 3,600-Pack 7/8" x 1/2" x 11/64" Polycord Collated Regular Clinch Clip. Fits Hartco Tools HR-65BAH, HR-65BAT, HR-65BSH 3,960-Pack 3/7" x 1/2" x 11/64" Polycord Collated Regular Clinch Clip. Fits Hartco Tools HR-65BAH, HR-65BAT, HR-65BSH 3,150-Pack 7/8" x 39/64" x 11/64" Polycord Collated Regular Clinch Clip. Fits Hartco Tools HR-65BAH, HR-65BAT, HR-65BSH 3,465-Pack 3/4" x 39/64" x 11/64" Polycord Collated Regular Clinch Clip. Fits Hartco Tools HR-65BAH, HR-65BAT 3,150-Pack 7/8" x 37/64" x 11/64" Polycord Collated Regular Clinch Clip. Fits Hartco Tools HR-55B, HR-66B 3,600-Pack 7/8" x 15/32" x 7/32" Polycord Collated Regular Clinch Clip. Fits Hartco Tools HR-55B, HR-66B, HR-85BA 3,564-Pack 3/4" x 15/32" x 7/32" Polycord Collated Regular Clinch Clip. Fits Hartco Tools HR-85BA, HR-85BF 2,160-Pack 7/8" x 43/64" x 7/32" Polycord Collated Regular Clinch Clip. Fits Hartco Tools HR-55B, HR-66B, HR-85BA, HR-85BF 2,520-Pack 7/8" x 35/64" x 7/32" Polycord Collated Regular Clinch Clip. Fits Hartco Tools HR-85SB10 2,856-Pack .615" x 23/32" x 1/4" Collated Regular Clinch Clip. Fits Hartco Tools HR-85B 2,040-Pack 7/8" x 23/32" x 1/4" Collated Regular Clinch Clip. Fits Hartco Tools HR-88B 1,400-Pack 7/8" x 27/32" x 5/16" Collated Regular Clinch Clip. We carry Classic Hartco series stainless steel clinch clips. 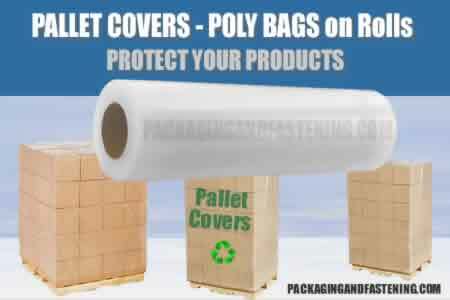 Applications include cages, fencing and other clip fastening uses in corrosive environments. Fits Hartco Tools HR-61Greater Slip-Resistance 3,360-Pack 7/16" x 43/64" x 11/32" Tape Collation Stainless Steel Clinch Clip. 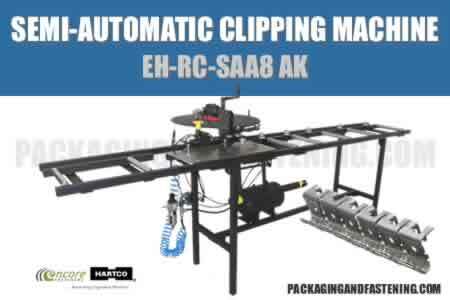 On-sale online now, buy Eclipser and Hartco Series pneumatic strip e-clips. Check out our collated air clips for your next clinch clip job including cages, cement wire fastening, bedding, furniture and other uses requiring efficient clip fastening. Pneumatic clip fasteners are available online. Order collated strip clips and automated coil clips here now. Get details. Paper covered, oil tempered, 16-gauge steel wire. Also known as silent wire or stake wire. Used to connect sinuous springs inside of furniture so they act as one unit of support. 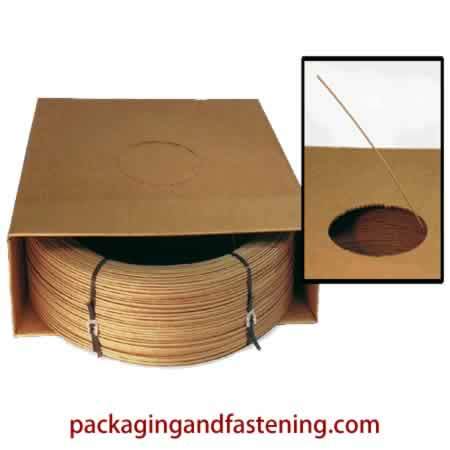 Heavy duty dispenser-style box keeps wire accessible yet neatly contained are here at packagingandfastening.com online. USE WTH: E-Clip strips; Encore Eclipser 2000 series tools; Hartco A, B and E Series Clinching tools. Learn more about the Eclipser and Hartco Series pneumatic coil e-clips. Discover our coil collated clips for your next air operated clinch clip uses including bedding, furniture and more. Pneumatic clip fasteners are available. Coil collated automated coil clips are available online. Read more. Fits Hartco HR-49CC, VRC Machine 12,500-Clip/Coil 7/16" x 15/32" x 11/64" Cold Rolled Steel Coiled Clinch Clip. Fits Hartco HR-49CC, VRC Machine 12,500-Clip/Coil 7/16" x 1/2" x 11/64" Cold Rolled Steel Coiled Clinch Clip. Fits Hartco HR-48CC, VRC Machine 9,375-Clip/Coil 7/16" x 35/64" x 13/64" Cold Rolled Steel Coiled Clinch Clip. Fits Hartco HR-48CC, VRC Machine 11,750-Clip/Coil 7/16" x 33/64" x 13/64" Cold Rolled Steel Coiled Clinch Clip. Encore's Eclipser and Hartco Series pneumatic clip fastening systems are available at packagingandfastening.com now. Air operated clinch clip tools for fastening uses including cages and traps, fencing, bedding, furniture and other wire to wire applications. 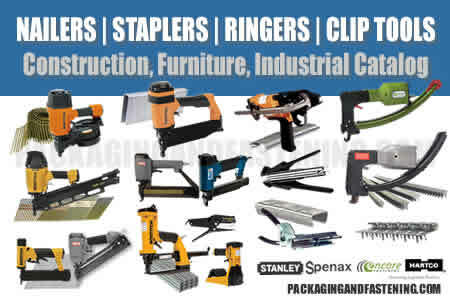 For your convenience, we carry pneumatic clip tools and clip fasteners on sale online. Our complete selection of highly-rated, efficient clipping systems benefit your ... Read more. LockNail applications include fastening upholstery panels and spring anchor clips for furniture and seating production are available at packagingandfastening.com now. Spring anchor clips for furniture and seating production are available at packagingandfastening.com now. Fits Hartco T40S5CLP 3,000-Clip/Coil Bulk Over the Rail Seat Spring Anchor Clip.